Under three flags. 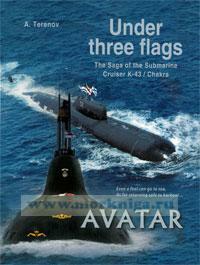 The Saga of the Submarine Cruiser K-43 ( Chakra) Terenov A.
Перевод на английский язык книги Хождение за три моря. Лебединая песня крейсерской подводной лодки "К-43". The author would like to thank the leadership of the Joint Stock Company "United Shipbuilding Corporation", Mr Vladimir Y. Dorofeev, Director General, Design Bureau "Malakhit", Mr Konstantin Y. Shilov, Director General, Concern AVRORA Scientific and Production Association, Commanders-in-Chief of the Russian Navy V. Vysotsky and V. Chirkov, Chief of the Naval Staff of India N. Verma, the Russian and Indian Admirals R.K. Sharma, R.N. Ganesh, A.K. Singh, A.S. Berzin, A.V. Burilichev, V.P. Valuev, R.A. Golosov, I.I. Naletov, K.S. Sidorenko, A.F. Shlemov, Captain 1st Rank G.B. Feldman for their help and kind words, which made me compliment my memories and republish them for the fourth time. Especially I would like to thank Alexey A. Kravchenko, Head of Information Policy and Communications, JSC "United Shipbuilding Corporation", and Alexander F. Mozgovoy, Editor-in-Chief, "National Security" magazine, as their advice had helped me a lot. The author with warm feelings recalls how the idea of the book and its name "A Vouage across Three Seas" were born during "a cup of tea" in company of Yuri I. Farafontov, Chief Designer, SBE "Malakhit", and Anatoly I. Adamenia, General Director, "Amur Shipyard". The first Indian CO of "Chakra" R. Ganesh and Captain 1st Rank lliya Y. Klementiev, Naval Attache of Russia to India with his wife Anna, have fulfilled an extremely hard task of translation the book into English. I endlessly thank them for this. Artists-designers Andrey Rudko (Design Bureau "Malakhit") and Anastasiya Bezgod-kova ("Sports and Culture 2000" Publishing house) have prepared this book for publishing. Книга является переводом на англ. язык книги Хождение за три моря. Лебединая песня крейсерской подводной лодки "К-43" (подарочная). • Of Bad Habits t.